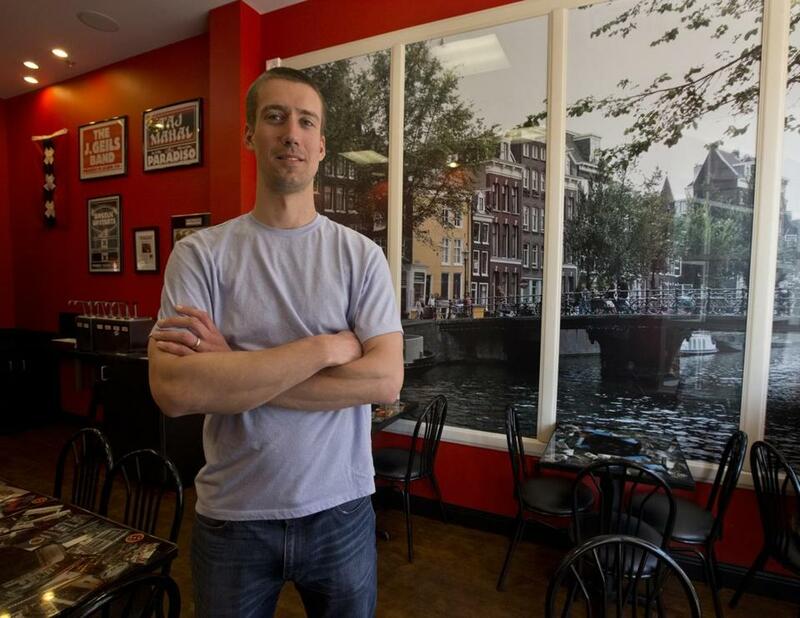 Matt D’Alessio is the owner of Amsterdam Falafelshop, which makes falafel that can be eaten with a variety of toppings. If a restaurant is only going to have two items on its menu, it better do them both incredibly well. So it is a good thing that Amsterdam Falafelshop has perfected the art of frying chickpeas and potatoes. But even limited to falafel and fries, you still have decisions to make. If the line is long (as it often is, especially on weekends and late nights when Davis Square is teeming), you will have time to consider your options. Don’t expect too much help from the counter staff — they seem to be cultivating a sullen hipster vibe more often found in Brooklyn than Somerville. Owned by Somerville resident Matt D’Alessio, the restaurant is a franchise of a Washington, D.C., spot started by a couple who fell for Northern European-style self-serve falafel joints while visiting Amsterdam. As a college student at George Washington University, D’Alessio was a regular at the D.C. restaurant, and despite his background as an engineer, had long dreamed of owning a small business. When he learned the original owners were looking for franchisees, he jumped at the opportunity and opened last July. Burger and burritos might be served up on every other corner, but D’Alessio recognized a hole in the Boston food scene. He says that falafel is a “misunderstood cuisine” and acknowledges that some people show up assuming they will find gyros and shawarma. Still, he has been overwhelmed by the positive response. He’s already thinking about another location. For now, you can only find the perfectly fried chickpeas in the middle of Davis Square, in a narrow storefront on Elm Street in the former Diva Lounge space across from other relative newcomers Foundry and Saloon. Walls are bold red, adorned with Dutch concert posters, large photos of Amsterdam, and a mural centering on a bare-breasted woman. Seating is tight — maximum capacity is 19 — so be prepared to take your falafel to go. First to decide: Will you have falafel in a pita or in a bowl? If pita, you pay a flat fee ($4.95-$5.95) and choose white or whole-wheat rounds; toppings come later. If you want to go more free-form, choose a bowl, pay by weight ($7.35 per pound), and order falafel balls with pita on the side ($1). French fries come with dipping sauces. Falafel is fried to order. The task of building a perfect meal is now in your hands. In pita, you face an engineering challenge since it can be difficult to fit all the delectable toppings into the small round. A sign advises you to “crush your balls” before stuffing the bread with salad and sauce, so the different flavors meld. If you choose the bowl, remember that you are paying by weight, and the cost adds up (you can rack up more than $10 in toppings plus bread). A long salad bar offers 21 condiments, including smoky baba ganoush, garlicky hummus, a “naked” salad of cucumbers and tomatoes, pickled beets that taste both sweet and sour, red cabbage, creamy coleslaw, crunchy white onions in red sauce, cucumbers and red onions, chickpea salad, a deliciously smoky Turkish tomato and onion salad, tahini, yogurt-dill sauce, absolutely divine fried eggplant, torrator (a blend of parsley and garlic), spicy red pepper, cilantro-jalapeno sauce, Lebanese pickles, house-made pickled cauliflower and carrots, and pickled turnips. About 1½ inches across, the fresh-tasting and satisfying falafel balls are crispy on the outside and a bright yellow-green inside, speckled with parsley and other herbs. Fries are “authentically Dutch,” also made to order, and fried twice for ultimate crisp outsides. You decide whether you want them salted ($2.95 and $3.95). 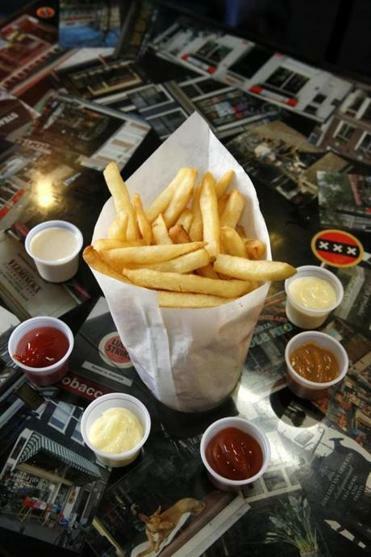 Dipping sauces include Dutch mayo, rich and tangy garlic cream, peanut sauce, and regular or curry ketchup. Conveniently, each table comes equipped with a hole perfectly sized for your cone of fries. The peanut sauce, while tasty, is the only option that doesn’t seem to work. Curry ketchup, on the other hand, is so addictive it may have you scouring ethnic food markets for a new addition to your pantry. You have just eaten some of the best falafel outside the Middle East. Put up with the hipsters serving you. They get it right. Laura Gitelson can be reached at lauragitelson@gmail.com.